Review date: 12 May 2004. Back in the misty, antediluvian days of, oh, 2002, the cooler you used on a Pentium 4 CPU didn't matter that much. Oh, you might pick something that was especially quiet, or looked particularly cool through the side window of your hilarious case, or only cost the $10 you had left in your wallet after buying a bare newspaper-wrapped P4 from a dodgy geezer at a computer market. But, by and large, cooler choice wasn't very important. 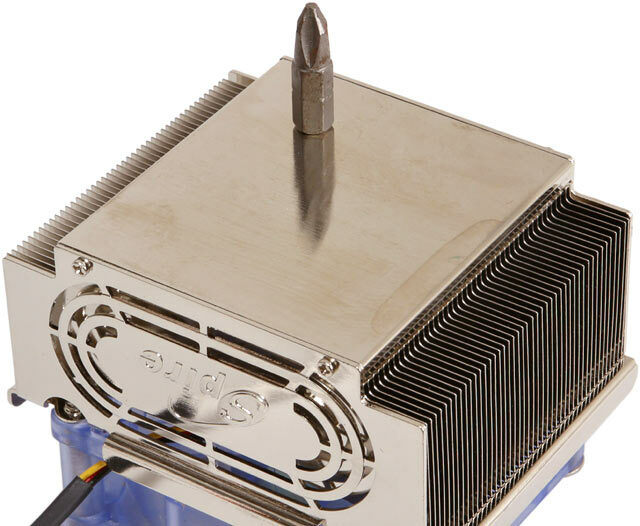 P4s didn't run terribly hot, P4 coolers were and are all quite large (fill that big P4 retention frame with metal and you pretty much can't help but end up with a good cooler), and P4s have big heat spreaders on top that give them a nice wide thermal pipe to the heat sink. 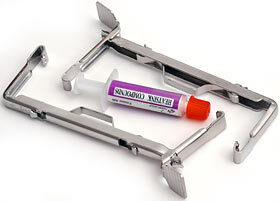 The spreader also makes it harder for novices to screw up the application of thermal compound. All but one of these variables has stayed the same. P4s still have heat spreaders and P4 coolers are still big, but nowadays P4s do run terribly hot. They run so terribly hot that Intel have had to call a halt to their hotter-still new P4 core development program, and fall back on something based on the more elegant Pentium M.
Don't hold your breath for Pentium-M-based P4s, though; Prescott-core chips and their relatives will be the P4 range leaders for a while yet. The Prescott core is, for many purposes, a tad slower clock-for-clock than the previous Northwood-core P4s, which remain a good buy. This year-old machine wound up to three point something gigahertz still mixes it well with the best stock-speed P4s Intel's managed to make so far, and a mildly overclocked system based on a (fairly) cheap 2.8GHz 800MHz-FSB P4C is, today, the sensible tweaker's choice. Yes, Prescotts have twice as much Level 2 cache memory as Northwoods, but that doesn't give them much of a speed advantage for most PC tasks. And Prescotts are all, frankly, lousy overclockers. And Prescotts run hot, hot, hot. Future Prescotts manufactured with a 65 nanometre process may have full-bore operating power that's lower than the 90-watts-and-change that users of current top-end P4s enjoy, but right now, Intel chips are the heat kings. The hilariously expensive 2Mb-cache Northwood-based Extreme Edition P4s are now peeking over the hundred watt Thermal Design Power line! Back in the day, all of the egg-cooking, house-heating, visible-to-weather-satellites jokes were made about AMD CPUs, but today you can make them about both of the fast processor architectures. It's not hard to find P4s that output more than the 89 watt TDP of a steaming Athlon 64. The stock coolers that come with P4s of all speeds are OK. The high end chips come with swirly-fin, copper-cored coolers first seen in the AVC Sunflower, and they're good. They're even adequate for overclocking, if you've got decent case ventilation. But if you want something with a better noise-to-cooling ratio, quality after-market heat sinks remain an excellent idea. This is Spire's SP420B8-2 CopperStream II. It's the dressed-up version of the original SP420B8 CopperStream, which I review here. The II looks quite different from the original CopperStream, primarily because its all-copper heat sink has been nickel plated. This is alleged to significantly improve its performance by itself, though I'm unconvinced. Like the regular CopperStream, the II is a weighty little nugget; about 508 grams all up (one pound, 1.9 ounces). What definitely does make a difference is the CopperStream II's fan, which is a show-off clear blue number with a shiny swoopy finger guard. The original CopperStream's dowdy black air-mover runs at 2500RPM and draws a nominal 0.96 watts (less, when it's got up to speed); the blue fan's rated for exactly twice as much nominal power, runs at 3600RPM, and is alleged to move 32.25 cubic feet of air per minute, versus 22.05CFM for the black fan. No fan achieves anything like its rated air flow specification when you stick it on a heat sink, and in my experience twice as much fan power can often add up to only marginally better thermal performance, especially when you're starting out with a strong cooler like the basic CopperStream. But more juice never hurts, especially if you're given the option to wind the fan speed down if you don't need the extra power. Here in Australia, Lownoise PC Supplies sell the CopperStream II as well as the original CopperStream - and both of them cost the same. $AU45 ain't a lot to pay for a zooty cooler. Lownoise PC also, however, sell the above-pictured rear-expansion-slot speed controller. You can buy it along with a CopperStream II for only $AU49. Four Australian bucks ain't much to pay for a fan controller. At that price, you might as well buy the thing even if you're not sure you'll need it. 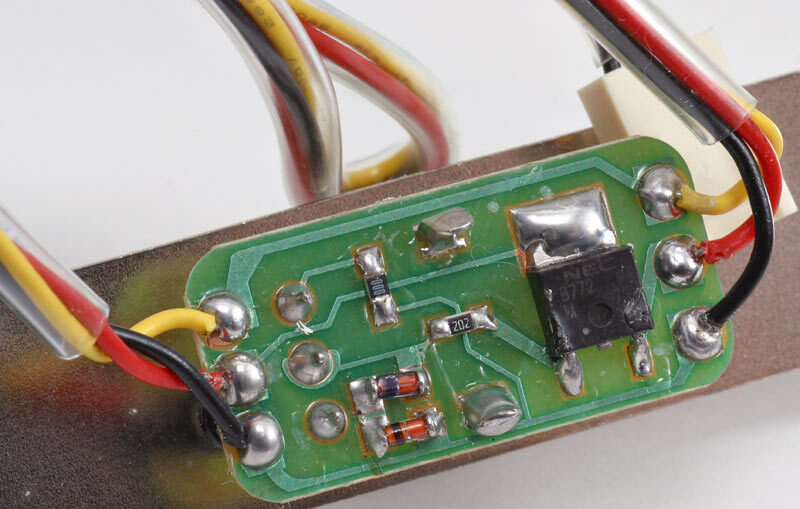 Instead of a mere, inelegant, in-line potentiometer, this speed controller uses a variably biased transistor to drop the fan supply voltage. It should, therefore, work the same way on various different fans - though I wouldn't count on one cute little minimally heatsunk transistor to cope with the current of anything with a nominal draw a whole lot higher than two watts. 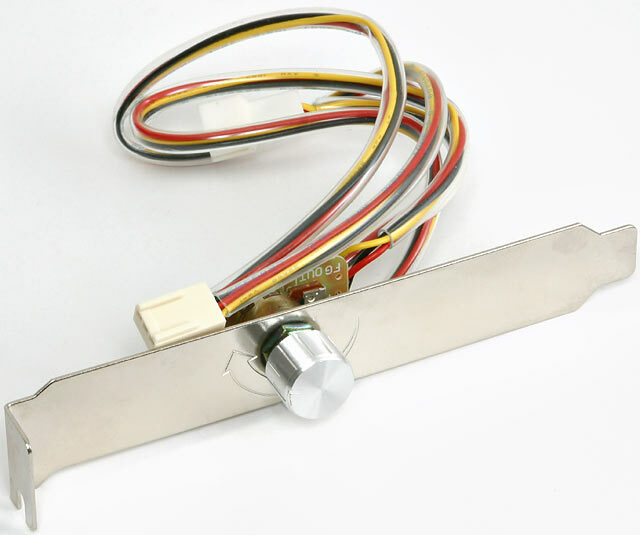 The speed controller passes through the yellow tachometer wire, so you can still monitor the speed of a fan when you're using it. The CopperStream II's as easy to install as the original CopperStream, as you'd expect. It comes with the exact same clip-on retainers, and the exact same little syringe of ordinary white thermal goop, which is why the above picture is actually the one from the original CopperStream review. Sue me. The plated base of the II's heat sink is shinier (Disclaimer: Random object to indicate reflectivity of base plate not included in standard retail CopperStream II package) than the original CopperStream's bare copper sink, though I don't think it's actually significantly flatter. Both are as close to perfectly flat as any sane person is ever likely to want. At full speed, the CopperStream II fan isn't quite quiet enough to satisfy silent-computing fanatics, though it'd definitely pass muster for most people. 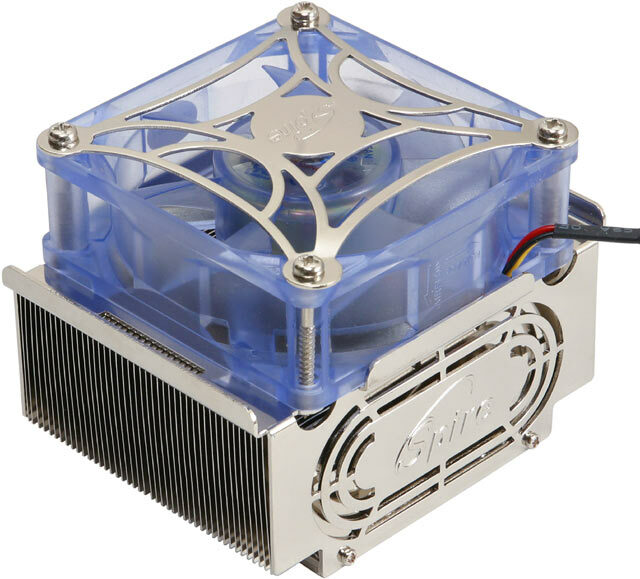 The exhaust fan of most PC power supplies will add much more noise to a room than will a CopperStream II buried inside the case. The speed controller, however, lets you wind the fan's input down to seven volts, which'll give something in the order of one-third power. At this speed, the fan is, for all practical intents and purposes, silent. Even quieter than the regular CopperStream. The plain CopperStream turned in a superb 0.44°C/W test result on my CPU-simulating heater. I've seen better P4 coolers, but not in the low noise category. Spire have really nailed this heat sink design. At full power, the CopperStream II worked even better, as you'd expect - 0.41°C/W. That's pretty darn extraordinary for what still qualifies as a low noise cooler. With good case ventilation (which can also be decently quiet, if you resist the urge to install ten watt case fans) it's really all you need for all but the most heroic P4 overclocking. With the speed controller turned down to minimum power, the CopperStream II still managed 0.53°C/W, which is quite acceptable for cooling the mid-range P4s (or even Celerons) that're all you're likely to need in a silent PC. Lounge room "home theatre PCs" are the usual systems that need to be silent, as opposed to merely very quiet, and they don't generally have to do a lot of computational heavy lifting. And, heck, a mere 2.4GHz P4 still ain't a slow chip, anyway, as merry pranksters have proven on those occasions when they've swiped the Extreme Edition super-chip from some poseur's PC and replaced it with a non-Extreme P4 with 70% of the clock speed, then sat back to see how long it took for the exchange to be noticed. The CopperStream II hasn't surprised me at all. I expected it to be a really good P4 cooler, and it is. This doesn't mean a CopperStream II's likely to let you wring any significant amount more clock speed out of a Prescott-core P4 than the stock cooler will, though. The limiting factor there is the already-close-to-redline processor core, not the enthusiasm of your heat-sucking solution. But if you're looking for a quiet-to-silent P4 cooling solution which, at full fan speed, can cope with pretty much anything that any P4 can throw at it, then Lownoise PC's CopperStream II and speed controller bundle is, at $AU49, an excellent buy. Review CopperStream II and speed controller kindly provided by Lownoise PC.